Cops & Robbers from Glu is a funny game that’s an odd combination of deep and dull. Breaking the Law: As a robber in Cops & Robbers, you can perform all sorts of fancy maneuvers—when the controls work as expected. Normally $3, but on sale for $1 as of this writing, the game’s storyline is simple: There are bad guys (the robbers), and the good guys (you guessed it, the cops). As the robber, you collect cash and steal diamonds—and try to evade the cops. In a clever twist, each level offers the cop as an unlockable character; if you can clear the level as a Robber, you can try your hand at enforcing the law, instead. So far, so good. But the controls and general gameplay don’t match the fun of the game’s premise. Cops & Robbers is played in portrait mode. Sometimes, you move your character by tilting the iPhone left or right, or by tapping either side of the screen—your choice. On occasion, though, you’ll hit seemingly random “checkpoints,” at which time your view changes. Now the game controls your left and right movement, and you’re responsible only for jumping. Ah, the jumping. 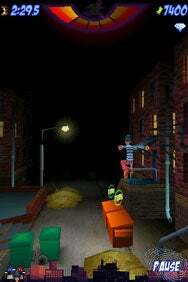 Jumping, achieved by tapping in the middle of the screen, is a central component of Cops & Robbers. By tapping to jump at just the right time, you can perform all sorts of fancy maneuvers: Leaping over crates, springing off dumpsters, and more. The more moves you pull off, the more your “boost meter” fills. Tapping that meter—or grabbing the occasional powerup—gives you an extra burst of speed. As you traverse through the different levels, each of which offers multiple routes to the finish line, you’ll need to achieve one of three goals to make the cop playable and advance to the next level. You must either beat a (generous) time requirement, collect enough money, or collect enough diamonds. Unlocking each of the nine levels is fairly painless. When you do play the level as the cop, your sole goal is to be faster than your “ghosted” best effort as the robber. If you beat your former self to the end of the level, you win—though that doesn’t mean much. Beating a level as the cop doesn’t impact the game; it’s pretty much a pat-yourself-on-the-back achievement. Cops & Robbers looks great. The backgrounds and the characters themselves showcase a unique visual style. Movement, though, is a bit too jerky. And the limited gameplay, which too often is nothing but jumping over and over again, leaves me feeling bored and frustrated. The frustration results from the game’s sensitively, which isn’t tuned too well; jump timing doesn’t seem consistent, and I often found myself running into walls or falling over when attempting jumps. To make matters worse, you’re forced to pick your language of choice and your sound preference every single time you launch the app, and the loading screens are quite simply the slowest I’ve seen on my iPhone to date. There are flashes of greatness in Cops & Robbers—they’re just too infrequent. Leaping between buildings to climb them, parkour-style, is fun (when it works), and the cut-scenes are a hoot. The ’80s cop show-esque soundtrack suits the game perfectly. In fact, the game seems totally lovable… until you start playing. Then, like your character will inevitably do too often, the game falls flat on its face. Cops & Robbers is compatible with any iPhone or iPod touch running the iPhone 2.2 software update.